Embroiderers' Association of Canada, Inc.: You can do that?? This is what some of my guild members said when I told them I had signed up for a two-day goldwork class at the Royal School of Needlework at Hampton Court, London, England. The answer is, "Yes, you can take a one-, two- or three-day needlework class there." I checked the Royal School of Needlework website when we were planning our trip to England and worked the London portion of the trip around the days of the class I want to attend. 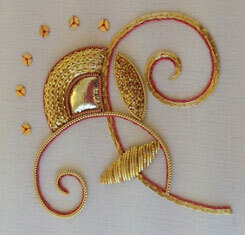 This time, it was a two-day goldwork class with Helen N. Stevens who trained at the Royal School and now specializes in designing and teaching goldwork. 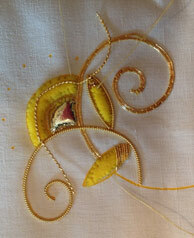 This was an intermediate level class for those who previously took the beginning goldwork class which was a bumble bee. We learned new techniques (cord padding and applying leather were new for me) and practiced working with the passing thread and the springy pearl purl. It was a fun class with only two students (medical emergencies kept the others away) so we had a lot of personal instruction. The classes cost around £75 per day and the kit costs vary – for this class, it was £30.